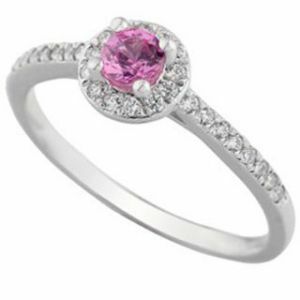 Fall in love with this exquisite Pink Sapphire and white Diamond halo ring. Capturing the romance of vintage styling, your ring features an intense Pink Sapphire gemstone, held within a four claw setting. Experience the dazzling brilliance of 0.14cts of perfectly cut Round Brilliant Diamonds graded H Colour SI1 Clarity encircling your Sapphire and set above a comfortable court shaped band. Forming part of our petite range, this exquisite design is an ideal choice for anyone looking for the ultimate pink Diamond Engagement Ring combining looks with exceptional value. Please allow around 5 weeks for your Engagement Ring to be crafted and delivered beautifully packaged to your door.